New Year’s Day was not far off when the above notice was posted on the front door of The Waterfront Ale House on Atlantic Avenue, Brooklyn, New York. I read it and knew that although the news was not unexpected, to see the fact publicly and physically presented in such an essential way. 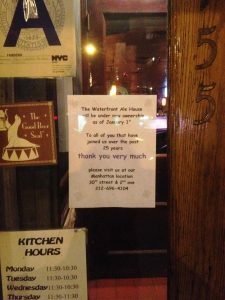 However, the most sobering item of that notice was not the fact that the place was closing, but that it had been an important part of my life for more years that from when I was born to when I moved to live in Brooklyn. The emotional shock dealt to me was especially stunning to realize that for over the last twenty-five years I had known where to go when I wanted a fresh, interesting and refreshing beer served with an inspired bar-snack and good conversation with interesting people hosted by a group of people who enjoyed what they were doing and took pleasure in doing it all the best way they could. It was the place that welcomed the New York City Homebrewers Guild to hold beer homebrewing demonstrations and competitions. It was a place where the owner took special effort to procure interesting beers at a good price. Beer tastings were the rule rather than the exception. The menu might have been limited, it was of a quality that exceeded most expectations. Enough room was left on the specials menu to allow the kitchen to do some experimenting. The increase in a young population that appreciated both good beer and interesting food, and could boast of including some of the best in the publishing, marketing, theater and film production as well as the folks that work with them such as artists, writers and production professionals meant that the customer base was almost a perfect demographic for The Waterfront Ale House. And then Sam, the owner, decided to move across Atlantic Avenue to a larger space and install a “smoker” in the kitchen. Almost the entire staff, and all of the regular customers, found their way across the Avenue to the new location. Week-end live music added to the ambiance on Saturday nights. The meat smoker in the kitchen allowed Sam to develop a skill at “Low and Slow” BBQ that was eventually national award-winning. The turn-over in the kitchen settled down and eventually included some especially talented people, as did the essential group in the front of the house. Both shifts of the week-day bar staff grew regular customer bases that was admirable. And so, it was for a quarter of a century all together. And then it ended. The Waterfront Ale House was not open for business. There was no more sitting down at the bar on a sunny afternoon and having an especially tasty and refreshing beer appear in front of me as if my psyche had pre-ordered it. I was going to have to break-in a new bartender somewhere. No more was I able to ask the head-cook-and-bottle-washer what he thought would whet my appetite on any afternoon. No more flirting with a thespian on her way to fame and fortune while waiting tables. In an instant there were no more “regulars” to get together with for a conversation not limited to sports and the in-house actress. An important part of my day had ceased to exist. Yes, the loss of a business is unfortunate, but the closing of a place like The Waterfront Ale House has repercussions that go beyond closing of a business. Friendships are tossed out. Rituals of life are lost. The memories; perhaps a picture or two, maybe a video on YouTube or an audio recording, might survive on a flash drive somewhere. Life went on. Thanks to social media bar-fly friends reunited and the staff members settled into new situations developing a network of new watering-holes for those of us still in touch to explore. Life goes on, but I now have a much better feeling for just how important the “Local” is to this society, like it or not. Great read- certainly hits home for many a bar regular!